The first of a two-part series, this 40-50 minute non-narrated interactive lesson is intended to help professionals with basic science background better understand the Earth’s gravity field and what causes its variations. 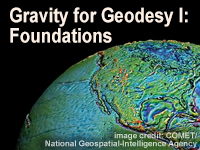 Of particular interest to earth/physical scientists as well as surveying engineers, this lesson covers Newton’s laws with a focus on Earth’s gravity field as it applies to geodesy. After a review of the basics of Newtonian gravitation and gravity, it explores how density, altitude, and latitude affect gravity. I would recommend this lesson to all geodetic surveyors. Very good introduction to the theme. I really recommend it! A good primer on earth's gravity. Excellent; with no wasted space. Basic but useful. Good visualization of geodetic and geocentric latitudes and good examples of magnitudes of the various effects on gravity. A good informative lesson to start with. The visuals and attached exercises support the learning of various concepts. The completion time may be a bit too optimistic and is only for perhaps grasping. Consider at least 2 or 3X more time for going thoroughly over the lesson. Furthermore, please notice that notation of geodetic latitude is 'lambda' instead of 'phi'. In many references, lambda denotes the longitude. A great way to do a quick brush-up on fundamental physical principles governing gravity on Earth. This was a very informative learning experience and I am going to recommend it to my colleagues. Very intuitive lesson, easy of undestanding and kind interesting. Test questions somewhat vague/confusing due to lack of information in presentation. This led to guessing due to lack of provided content in body of question itself. I really enjoyed the subject, having no knowledge of geodesy. It was a fascinating lesson and advanced my understanding quite a bit. The topic was explained in a readily and clear way. I enjoyed the exercises illustrating concepts. I did not take the lesson, only the pre-test. I answered the above based on the pretest, and how well it worked, and informed, and on the excellent, and generous, products from MetEd. I respond to let you know of the error. I got up in the middle of the night to cool a bag of ice for my back. I left the class because it was cool. Thanks for your help in educating me and your wonderful work. A very interesting primer on Geodesy. The content is awesome and helps to better understanding of Gravity. A straight forward explanation of the science with relevant questions. A summary which grouping the different effects on gravity (which are discussed) with their relative magnitudes would be useful. Define the basic properties of gravitation. Explain the properties of gravitation near a large mass such as a planet. Explain the relationship between gravitation and gravity. Identify density, altitude, and latitude as the three key influencing factors on gravity. Explain how gravity’s magnitude varies with latitude. Show how gravity’s magnitude decreases with altitude. Give examples of high and low density features of Earth and the resulting changes in gravity. Describe the impact of mass movement on gravity. Identify the signals that gravimeters measure.